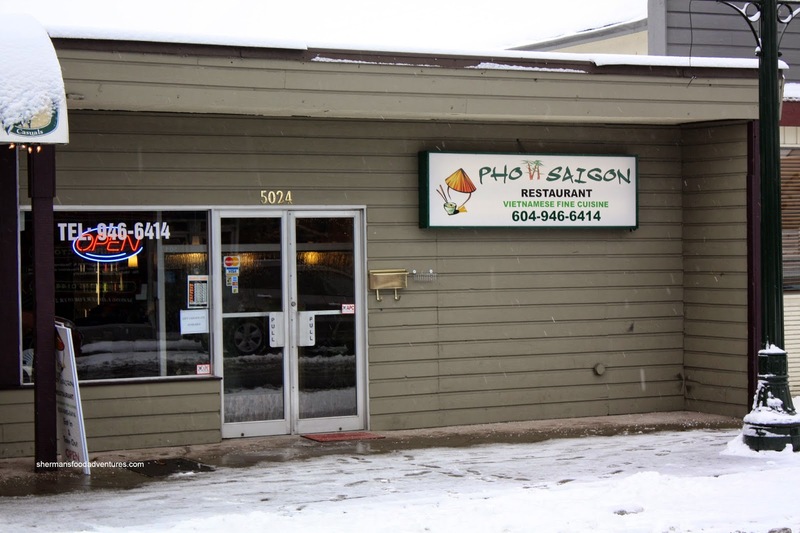 My initial visit to Pho Saigon in Ladner was a relatively mediocre experience. Hence, the likelihood of doing a return visit was as good as finding affordable housing in Vancouver. But with Prairie Momma nixing my plans to eat a heavy meal and requesting Vietnamese, that meant only one thing - head back to Pho Saigon. Hey, if you are the only choice in town, it quickly becomes a North Korean ballot - one choice only. Oh and never mind the snow, I was just lazy and put up the old picture. Well, it does give it a North Korean look right? 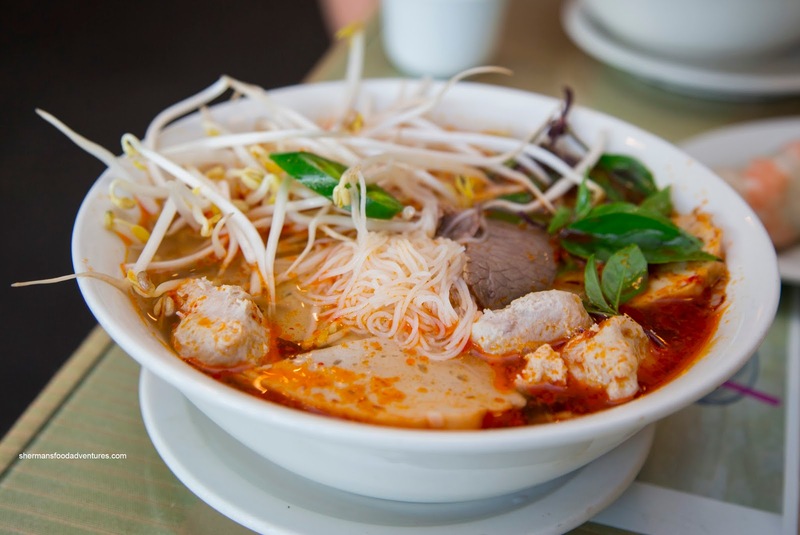 Unlike my last visit, I wanted to try something different in the Bun Bo Hue. Well, that was a mistake as they used regular rice vermicelli rather than the thicker lai fun. Instead of slippery chewy noodles, I got thin, drier-textured noodles that changed the dynamic of the dish. The soup was very flavourful though, but not in a balanced manner. It was spicy, but I couldn't make out any lemongrass nor shrimp paste. The meats were okay, yet there was no pork blood or knuckle (but I guess I shouldn't have been surprised). 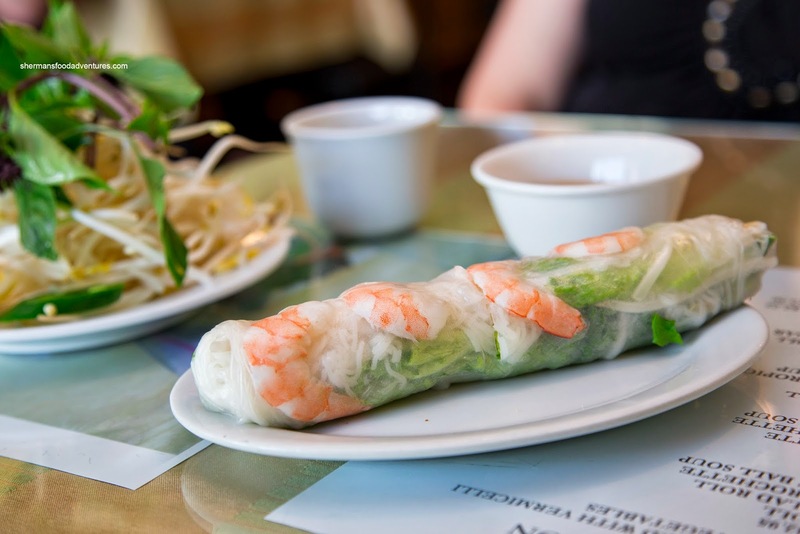 I also added a side of Spring Rolls and they were miraculously wrapped in rice paper (with the previous dish, I expected wheat wrapper). These were good as the outside was fried just enough for that blistered appearance and crispiness. 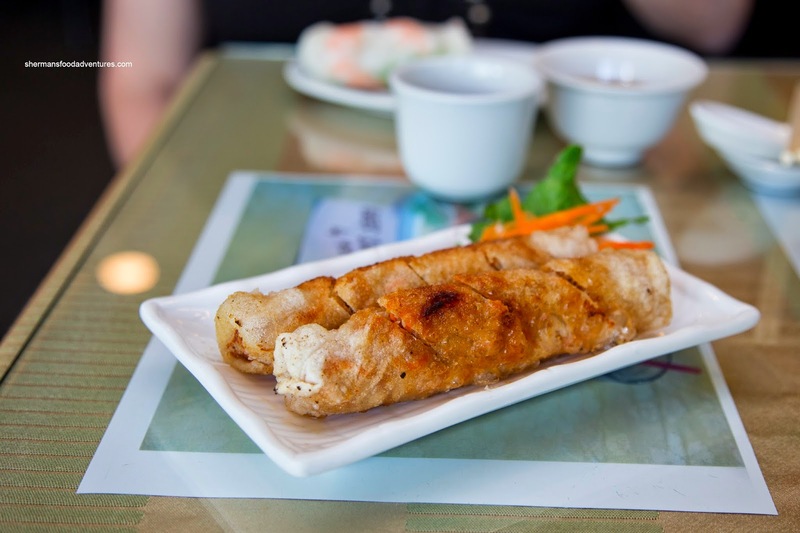 The filling was somewhat loose, yet moist and flavourful from the sweet onions and fish sauce. Prairie Momma started with the Salad Roll. Although not particularly large in size, the execution was there. The rice wrapper was soaked just enough that it was soft, but it maintained a moist chewiness. Inside, the ingredients were texturally on point and the dip was balanced. 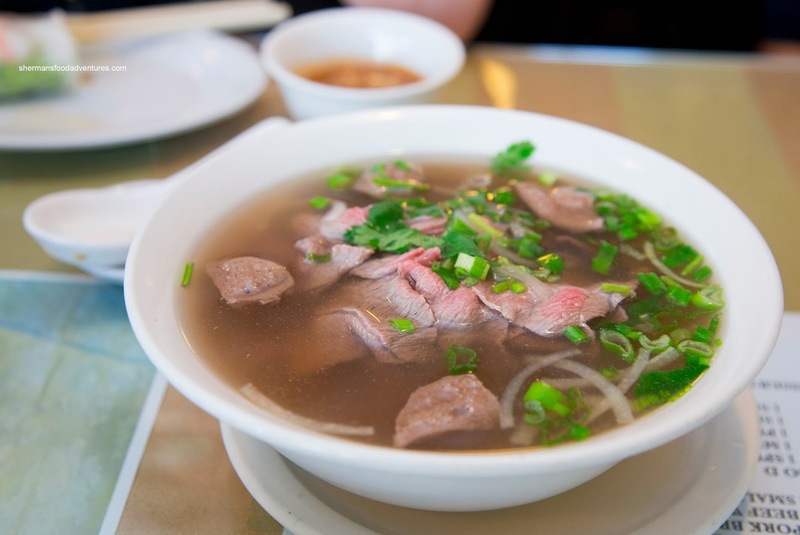 Onto her main, she had the Pho which featured a scorching hot broth. It was fairly clean tasting, but not really that impactful. It wasn't bland per se, but there wasn't a whole lot of meatiness. Instead, it was mostly sweet where we couldn't taste some of the individual components. On the plus side, the noodles were al dente and meats were tender. 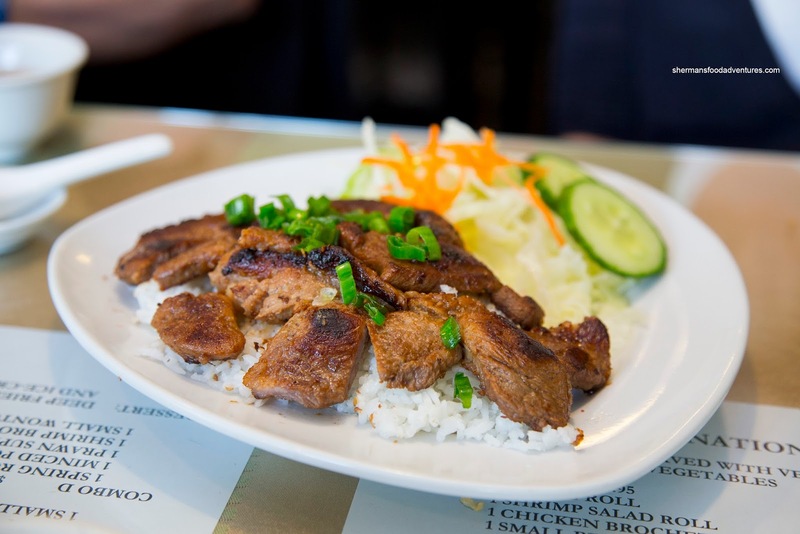 Miss Y decided to go for the Lemongrass Pork Chop on Rice and she was not particularly happy with it. The pork chop itself exhibited no char whatsoever. Hence, there was no caramelization of flavours. It was almost as if the meat was "steamed" rather than grilled. Hence, the meat was wet on the outside while chewy and dry on the inside. To top it off, there was a general lack of lemongrass as well. They should've marinated the meat longer and used a hotter grill or flattop. So as you can clearly see, this meal did not change my mind about the place. Someone would have to drag me kicking and screaming to return.